By bringing together such experts, the Trust for Public Land is helping to facilitate urban agriculture in the City of Boston. Back in 1972, the organization’s founder, Huey Johnson, recognized that negotiating land deals calls for expertise in law, real estate and finance. The trick to open space preservation, as he saw it, was to employ the strategies of modern business. Forty some odd years later, TPL has seen through over 5,300 parks and conservation projects in the majority of the nation’s states as well as Puerto Rico and the U.S. Virgin Islands. Land tenure, or an arrangement to rent or lease land, represents a realistic solution to the security issue most would-be urban farmers face. To address this need, TPL seeks to find ways to acquire land, attend to infrastructure requirements and ultimately turn the holdings over to urban agriculturists to farm. 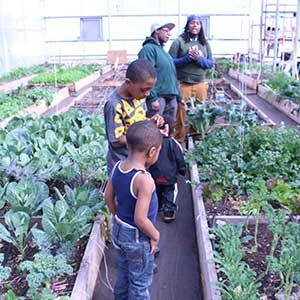 TPL helped facilitate the passage of Article 89, Boston’s urban agriculture zoning ordinance. With the way for urban agriculture cleared, TPL is getting down to the business of developing farms by partnering with local organizations intent on the same goal. For its first project, TPL identified two local organizations with strong assets to bring to the table. One is the Dudley Neighborhood Inc. a community land trust based in Boston’s Roxbury neighborhood, and the other is the Urban Farming Institute, a Boston-based organization founded in 2012 for the purpose of supporting the development of income producing urban farming. The collaboration is about putting together a vehicle with multiple partners who bring their unique expertise to the table, says Lapoint. TPL is equipped to address legal real estate issues and to design and develop site infrastructure. “But (we are) not set up to own land,” says Lapoint. Another critical aspect of the partnership is farmers. This is the piece of the puzzle that UFI brings to the partnership. “UFI’s core mission is to connect low income farmers with land,” said Lapoint. An opportunity provided by the city served as the impetus for the collaboration. Looking to continue actions to promote urban agriculture once Article 89 was enacted and a preliminary trial proved successful, Boston’s Department of Neighborhood Development identified three land parcels suitable for farming and invited interested parties to submit bids for their development. A request for proposals was made public in December and the final deadline was set for the start of February. This week TPL received welcome news. Optimistic about their chances of having their bid selected, TPL began several months ago to raise funds for the project. In negotiating land deals for urban agriculture TPL is venturing into new terrain. Looking to the future, Essington and LaPoint see TPL’s evolving to support greater sustainability. With this in mind, in addition to working on projects involving city owned land, TPL is talking with private landowners to arrange deals for long-term leases. Lapoint credits the steady support extended to urban agriculture by Governor Deval Patrick, former mayor Thomas Menino, and Boston’s office of Food Initiatives headed by Edith Murnane as essential to advancing the movement.